Building renovation in France, a reservoir of energy savings to be exploited | Energy 3.0 : the webmagazine about energy efficiency. 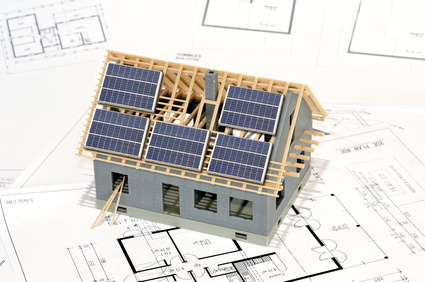 2012 thermal regulations require all new buildings to comply with “low energy buildings” standards. But it is in the renovation of the existing building stock that the greatest potential for energy savings lies. With 70 million tons of oil equivalent, building stock in France is now the most energy-hungry economic sector. It is also responsible for 25% of national CO2 emissions. Regulatory developments planned by the Grenelle Environment Forums in the Building Plan for 2012 (all new buildings must comply with the Low Consumption Building or BBC label) and 2020 (all new buildings must be “positive energy” buildings) should pave the way for an eco-friendly future, but will not resolve the burden of the building stock in the future energy crisis. Thermal renovation is one of the priorities of the Building Plan adopted in the context of the Grenelle Environment Forum. With many incentives and the use of cutting-edge technologies, this is a very promising market for the small building and renovation trades. Skilled building workers are increasingly confronted with recent technological progress in this area, which raises the question of their access to information. Representing 66.4% of total energy consumption in the building sector, housing stock represents a considerable reservoir of energy savings: the Building Plan is projecting 400,000 building renovations per year from 2013. The State is setting an example and energy-hungry public buildings will be renovated as a priority beginning in 2011. The government is supporting the sector through several incentive schemes: the ecological zero interest loan (Eco PTZ) is encouraging individuals to undertake renovation work costing up to 30,000 euros. The ecological social housing loan, aimed at social housing landlords aims to begin work on renovating 800,000 social housing units by 2020. Other measures exist: “sustainable development” tax credits, grant-aid from the national housing agency ANAH and local authorities as part of their Agenda 21 program, zero-interest loans for acquisition and renovation etc. Certainly the buildings needing to be renovated will probably never attain energy performances that are as good as those of future low energy buildings (BBC). But this limitation does not prevent high ambitions: a 38% reduction in energy consumption by the building stock is targeted for 2020.